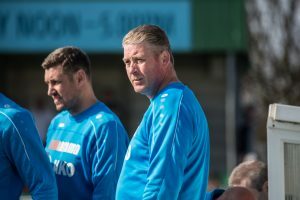 Blyth Spartans manager Alun Armstrong highlighted his son and former Spartan Luke Armstrong as “the difference” following yesterday’s 3-1 defeat Gateshead. Luke, whose goals in the 2016-17 season helped return Blyth to the second tier on Non-League football for the first time in five-year, starred by scoring a hat-trick on his return to Croft Park. He left Spartans to join Middlesbrough – spending last season in their U23s set up before being sent to the Heed in a season-long loan deal in order to test himself in the National League. And after capping off an impressive pre-season against his old club, his Dad believes if Blyth had the striker at their possession, the result would have gone the other way. “Results are imperative but, and it sounds daft because I’m his Dad but if we take Luke out of that team and put him in our team – we win the game!” Alun said. “Luke is lucky he’s going out with the Gateshead lads tonight because he wouldn’t have got in the house!” the Blyth boss laughed. “Honestly, we joked about it last night at home. He said he’d score a hat-trick! His Mam said to me, Luke will score a hat-trick and he did. “That’s the difference. You just look at him, he’s gone away from here and worked exceptionally hard at Middlesbrough – he’s developed – everyone can see the size of him now. However, despite Luke’s standout showing, Alun thinks the game still could have gone either way and overall, is pleased with pre-season – because it has been relatively injury free. He said: “Gateshead and South Shields were the teams that would give us an idea of what we’re up against this season. “I thought for parts of the game, there wasn’t anything in the game – it could have gone either way. “I was chuffed to bits with the game because it was really competitive. It felt like a proper game and that is what we needed. “There were a few stiff legs in the first-half – we looked a little bit lethargic. Robbie [Dale] has just come back from holiday so needed that first-half! “The second-half, you could see the change in tempo, they played exceptionally well and I think we could have been in front – we should have been in front. “Then you make changes, they make changes and the game tends to peter out a bit – we got sloppy for the two goals. “Jordan Watson has just come back there – that’s his first taste of a real game and some of the things that happened, wouldn’t have, if he was fully fit.